Watch silvery fish come up on the beach to spawn! Learn about the interesting mating rituals and growth of this curious fish. The Aquarium opens at 8 pm and an auditorium program begins at 9, followed by guided observation at the beach. You must arrive before 9 pm to see the movie. Warm clothing and a flashlight are recommended. 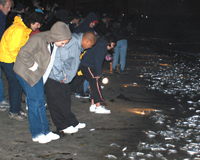 During the month of June, grunion may be taken by hand only. You must have a valid 2019 California fishing license if you are 16 or older. MEMBERS ATTEND FREE – SIGN UP TODAY! *The CMA Gift Shop will be open late for guests.